Lifetime’s Project Runway Season 11 started with a twist when the producer’s dropped a bomb on the fashion designer’s, and told them that they would be competing as teams. This twist largely worked, and created more friction and drama this season. During the Project Runway Season 11 Reunion Show, host Zanna Roberts Rassi, Senior Fashion Editor of Marie Claire, said that the team competition was “setup to create better managers and communicators” in the collaborative world of fashion design. While that sounds noble, it’s the team friction that creates the drama. The drama keeps viewers engaged, and Season 11 had lots of it. One surprise that was revealed during the reunion show was that the designer’s have an average of 7 hours to create their garments. That’s incredible - and I don’t know how they do it. Over the course of Season 11, I thought that Stanley Hudson was the favorite to win. His garments were consistently elegant, and his skills as a tailor seemed a cut above the other contestants. I also believed that Layana Aguilar and Samantha Black would be the other two designer’s competing at New York Fashion Week, and I was obviously wrong. 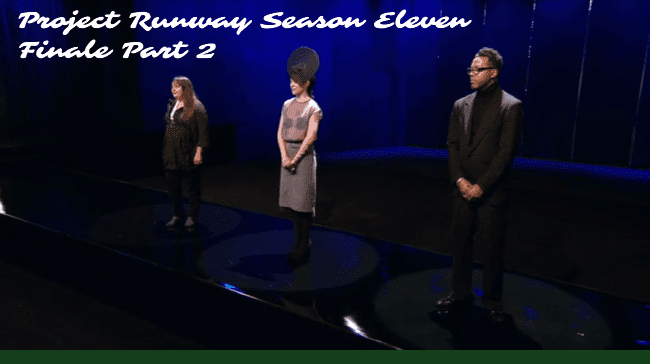 Michelle Lesniak Franklin, Patricia Michaels, and Stanley Hudson competed for the Project Runway Season 11 crown, and had the opportunity to show their 12 look collections in the finale. 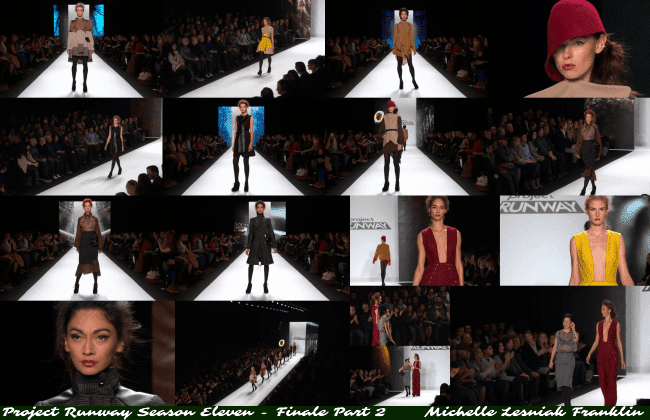 Michelle’s “lone wolf” inspired designs went first, and her collection was cohesive. The colors were largely muted, with a few exceptions. Her attention to detail, some exceptional quilting, and her leather accessories, set her apart from the other designers. She designed an amazing bleeding heart sweater that was my personal favorite. Patricia’s tree inspired collection was next. Unlike Michelle, she designed textiles with vibrant colors. Her collection was unique, and she created her own textiles, sequins, scarves, jewelry, and hats, that reflected an avant-garde approach to fashion design. Her collection was different in a good way, and not as cohesive as the others, and I applaud her for staying true to her vision. Stanley’s “urban opulence”collection was last. As expected, he used rich fabrics and elegant textiles, in each look. What was most shocking to me was the fact that he was unprepared for the runway show, and was sewing models into their clothes right up to the last minute. It was as if the pressure to win was so great, that he rebelled against expectations, and set himself up to fail. 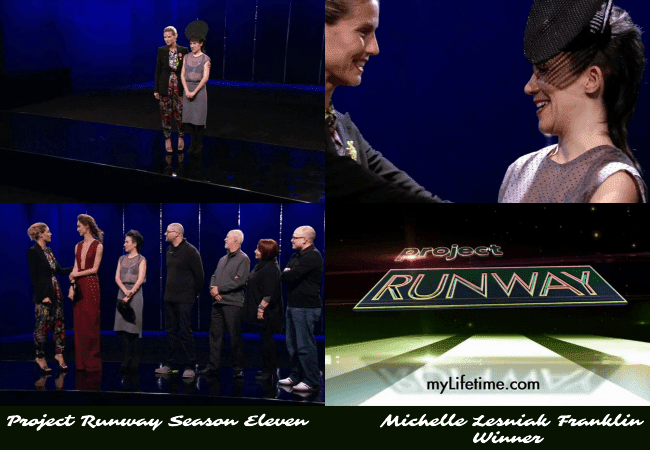 Judges Heidi Klum, Zac Posen, Nina Garcia, and guest judge Michael Kors, chose Michelle Lesniak Franklin as the Project Runway Season 11 winner, and there’s no question that she was worthy of the crown. Patricia Michaels was the runner up, and Stanley Hudson came in third place. If there was an award for congeniality on the show, I would give it to Amanda Valentine. Daniel Esquivel overcame a tremendous amount of adversity to finish in fourth place, and is proof that there’s always a second act in life. I wish that Samantha Black had gone further, because she has a distinct voice that needs to be heard. Patricia Michaels is an amazing fashion designer and mom, and the brief interactions she had with her kids on camera made my heart smile. Michelle’s honesty was incredibly refreshing, and I’m glad she was given a second chance, where she overcame the odds to win. After 11 seasons and 2 All-Star editions, Project Runway still works. Project Runway Season 12 will premiere on Lifetime this fall.